Why was Faith House begun? Faith House Ministries is inspired by the life and dreams of Faith Mercy Awour, one of the first students in the Rafiki Girls’ Center in Nairobi, Kenya. Faith died tragically in 2005 after a lifelong struggle with poverty and neglect, but her giving spirit and her vision of a more hopeful future inspires Faith House today. Faith joined Rafiki in 2002 and quickly established herself as a talented young painter and a deep, sweet Christian. Over her three years at Rafiki, Faith expressed her heart’s desire: to own a home of her own, a BIG home with many rooms that could shelter girls who had grown up as she had. She prayed that no one would be forced to live as she did. Faith was an orphan. When her parents died, Faith found herself dependent on siblings and distant relatives, each with their own families and unable to support her. Many days, Faith’s only meal was the lunch with fellow students at the Rafiki Girls’ Center. When it rained, Faith’s home flooded and she arrived at school soaked through, but always smiling. Faith was practical, she knew that all her plans were dependent on obtaining her Kenyan identification card. This was the only way to get a job, to purchase a home, to help girls like her. The search for documents and supporting information led her to Eldoret, her family home in western Kenya, where she arrived gravely ill. Faith died in the summer of 2005, overcome by the barriers of poverty and neglect. But her death magnified a need that had become more and more evident to those who worked with and loved the girls of Rafiki: too many single young women in Kenya simply were not safe. This is the need that Faith House was founded to meet. In November 2007, Agnes Nyambura and Damaris Njoroge took eighteen exams covering everything they had learned during their years in high school. The exams marked the completion of their work in Danana Girls Secondary School and the Kenyan national exams. Reaching this giant milestone was miracle for the two girls, and planted the seeds from which Faith House has grown. Damaris and Agnes shared a thirst for education from their earliest days, but followed different paths to their goals. Oldest of eight, Damaris acted as the stabilizer in her family. Showing an eagerness for education and performing well in primary school, Damaris was crushed to learn the truth: secondary schools in Kenya are not free. Even public schools charge school fees that are impossible for a family struggling simply to feed the children. Agnes grew up in a tiny village clinging to the steep foothills across a valley from Mount Kenya, the third of four children. Her parents absent, Agnes’ primary school years were broken by blocks of time when her grandmother pulled her from school to work in the vegetable garden. With such interrupted attendance, Agnes surprised herself and her family with high marks on the primary KCPE exams, high enough to take her to a good secondary school. But her family was unable to provide school fees. Agnes left home when she was fourteen, taking a succession of house-girl jobs, always searching for the path that would lead her to school. Both girls searched for ways to continue their education and found Rafiki, a pre-vocational program in the town of Mwiki. Each followed grueling schedules to balance attendance in Rafiki, their work and home responsibilities, and their higher education goals. Damaris and Agnes longed to continue their education in a real boarding school, where learning was the focus. Their ability and intellect merited such advancement. But they'd gone as far as the support they'd gathered could take them. Responding to the hunger for learning in these outstanding young women, and so many others like them, Faith House began with the commitment to take these girls in school through secondary school and beyond. It’s fairly easy to fall in love with a child, an orphan whose needs are so plain and so heart-wrenching, a little one who is so cute and helpless. It’s not so easy to fall in love with an awkward teenager, already showing a bit of rebellion, already pulled by the strong demands of family and culture, already beginning to make seriously destructive choices. And yet, during time in Kenya, God wrote those teenagers on the hearts of six American individuals who each had a part in the beginning and early years of Faith House. 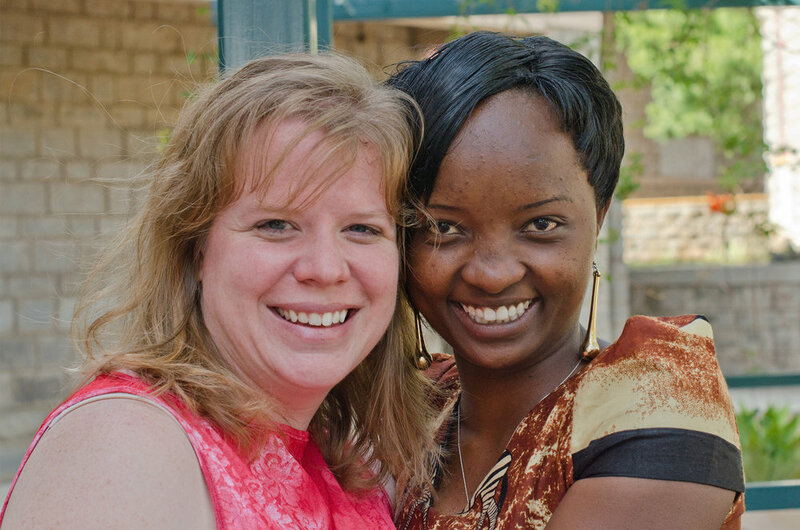 Jane Pope, serving with Rafiki as Girls' Center Director, discovered a deep "mother love" for a group of young women put at risk by their age, gender, and cultural pressures. Gretchen Bartlett, a long-term/short-term missionary to Rafiki, was so moved by the needs of the girls that she gave herself to serve for ten years as the first Resident Director of Faith House. Faith House was Gretchen's dream brought to life. Mary Reeve fell in love with three of the Rafiki girls, two of whom translated for her in a community clinic, and became our chief prayer warrior and encourager. Bill Reeve, Mary's husband, sharing his wife's compassion and love for the girls, brought years of business wisdom and knowledge and served on the Faith House Board of Directors as our primary advisor. Dr. Dan Pope, Jane's husband, grew to love the girls while he worked with them in Rafiki Community Clinics. Greg Pope, son of Dan and Jane, grew to love the girls through his parents and has been a member of the board from the beginning. Faith House began because love and expertise came together in these six. Prayers were offered, “What’s next, Lord?” . . . “Where?” . . . “By what means?” . . . And the Lord drew attention to a small inheritance in a trust department in the US and whispered, “Use this . . .” With the Lord’s gentle pressure, and with the kind acceptance by Anna Ndonye, founder of Danana Girls’ Secondary School, the education component of Faith House Ministries began. Jane wrote of the beginning of Faith House from her point of view: "When we returned to the U.S. to care for my mother, I grieved deeply, knowing that my work with the girls was not yet finished. In reading the book, Same Kind of Different as Me, I found a beautiful explanation of why I could not simply return to the US and “catch and release” these girls. Faith House began as a way for me to continue support for and involvement with the girls, even from a distance." Today, Faith House is what Faith dreamed it would be--a home with many rooms, each sheltering girls like her.